Patricia de Lille has announced her resignation as both mayor of Cape Town and as a member of the Democratic Alliance. 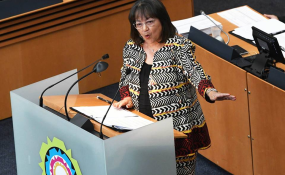 De Lille addressed journalists outside the Western Cape High Court on Wednesday, where she had filed an application to review the independent Bowmans report into maladministration in the City. In dramatic fashion, De Lille signed her resignation letter outside the court in the presence of the media. In doing so, she took aim at City of Cape Town Speaker Dirk Smit, who she slammed for incorrectly stating that he had already received her letter the day before. "I am also resigning as a member of the DA. I can no longer stay in this abusive relationship," she declared to loud cheers from her supporters around her. "After 18 months, I am free. Free from oppression. Amandla!" De Lille cried on the steps of the courthouse. The outgoing mayor's resignation will be effective from 19:00 on Wednesday. She said she would be taking "leave" for two weeks to decide her next move. Two councillors have resigned and more are expected to follow, she said.